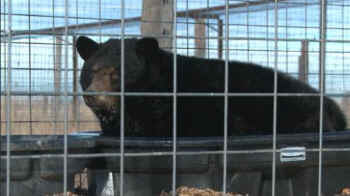 Great news for a bear named Ricky! 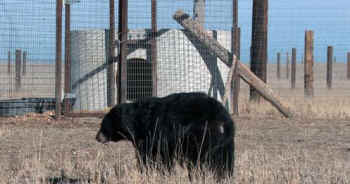 After spending 16 miserable years in an undersized chain-link and concrete cage at a Pennsylvania ice-cream shop, Ricky is now residing at the Wild Animal Sanctuary in Colorado. Her release comes as part of a settlement reached between ALDF and Ricky’s former owner. In December 2014, ALDF filed a lawsuit on behalf of concerned Pennsylvania residents against Jim Mack’s Ice Cream for displaying a female black bear named Ricky in inhumane and dangerous conditions. The lawsuit accused Ricky’s owner, James H. McDaniel, Jr., of violating state regulations that require humane care for wild animals. After Ricky was out of the cage, an ALDF representative went inside and remarked "All I could think was how for sixteen years, somebody spent their life in this tiny cage..."
The conditions Ricky were kept in were anything but humane—for years she lived in a pathetically small cage, without any enrichment, and fed dried dog food by visitors. Veterinarians confirmed that Ricky suffered high levels of stress and anxiety on top of an inadequate diet and substandard housing. Dr. Ursula Bechert, DVM, observed Ricky and noted that a “slow and torturous decline in physical and mental health” was inevitable for Ricky if she wasn’t moved to a sanctuary. Bears require large, environmentally complex spaces in which to engage in their typical movements, such as bathing, exploring, climbing, and denning. And that’s what she’s going to get at the Wild Animal Sanctuary in Colorado. At the sanctuary, Ricky will now have 15 acres of safe space to roam. Ricky was put in a holding pen after arriving at the sanctuary to get acclimated to her new habitat—and decided to take a bath! Ricky will soon have access to acres of open space and enrichment. The public complained about Ricky’s former situation at the ice cream shop for more than a decade. In fact, petitions with nearly 200,000 signatures in total, had voiced public clamor for Ricky’s release—the petitions even received celebrity participation from comedian and animal lover Ricky Gervais.